You learned in “Learn Linux, 101: Manage file permissions and ownership” that Linux is a multiuser system in which each user belongs to one primary group and possibly to additional groups. Ownership of files in Linux is closely related to user IDs and groups. Recall that you can log in as one user and become another user by using the su or sudo -ssudo-s commands. And recall that you can use the whoami command to check your current effective ID, and the groups command to find out which groups you belong to. In this tutorial, you learn how to create, delete, and manage users and groups. You also learn about the files in /etc, where user and group information is stored. See ” Learn Linux, 101: A roadmap for LPIC-1” for a description of and link to each tutorial in this series. The roadmap is in progress and reflects the version 4.0 objectives of the LPIC-1 exams as updated April 15th, 2015. As tutorials are completed, they will be added to the roadmap. This tutorial helps you prepare for Objective 107.1 in Topic 107 of the Linux Server Professional (LPIC-1) exam 102. The objective has a weight of 5. To get the most from the tutorials in this series, you need basic knowledge of Linux and a working Linux system on which you can practice the commands covered in this tutorial. You should be familiar with GNU and UNIX® commands. Sometimes different versions of a program format output differently, so your results might not always look exactly like the listings and figures shown here. For my examples in this tutorial, I use openSUSE Leap 42 and Fedora 23. These two distributions manage users and groups in two alternative ways, and you should be familiar with both ways. Unqualified references to Fedora or openSUSE systems refer to these two systems. You add a user to a Linux system with the useradd command, and you delete a user with the userdel command. Similarly, you add or delete groups with the groupadd and groupdel commands. For user and group administration, most modern Linux desktops have graphical interfaces that usually are accessible through menu options for system administration. Interfaces vary considerably, so the one on your system might look different from the graphical examples here. Despite these differences, the underlying concepts and commands are similar. Figure 1 shows the graphical KDE user interface on an openSUSE 42 system. For comparison, Figure 2 shows the graphical GNOME user interface on a Fedora 23 system. 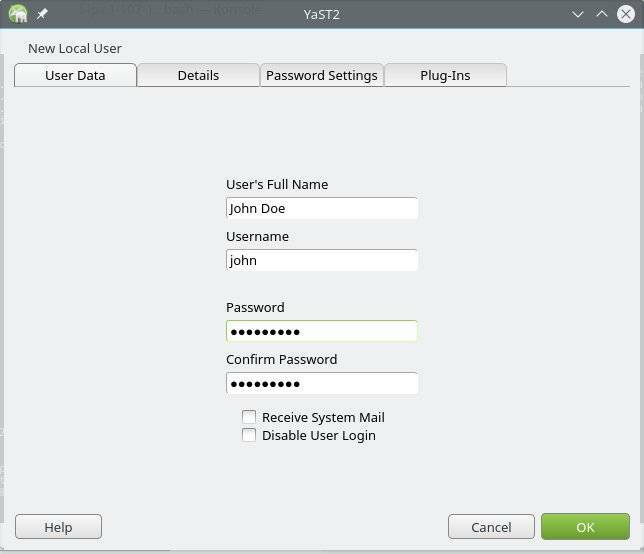 First, I show you how to use the graphical interface to add a user, John Doe, with username john, to the openSUSE system. Click the Add button that you see in Figure 1 (or the corresponding button if your UI language is not English) to add a new user. 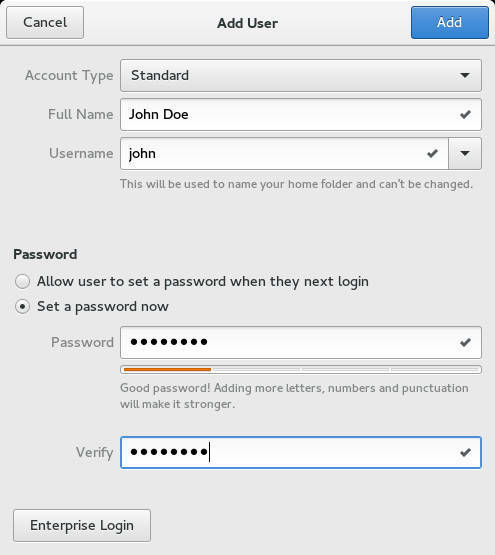 Then enter John Doe as the user’s full name, john as the username (or ID), and a starting password, as shown in Figure 3. Click OK to create the user. You now have a new user, john, who has a home directory /home/john. Use the id and ls commands, as shown in Listing 1, to verify. As you see, user john has a user number (uid) of 1001 and is a member of the users group. From the command line, you use the useradd command to create a new user and then use the passwd command to set the user’s password. Both of these commands require root authority. Listing 2 shows the basic use of these commands to add another user, jane. The -c option of useradd provides a text string, such as a name, to be associated with the user, and the -m option requests creation of a home directory. Different systems can have different approaches to user addition, other than differences in the graphical interface that you might use. For example, in the Fedora 23 GUI, you must first click the Unlock button to unlock the dialog box, and then click the + button to add a new user. As for the openSUSE example, you enter the user’s full name and the username (or ID) that you want to use. You can either enter a starting password as shown in Figure 4, or let the user enter a password on first login. Note the strength assessment for the password that you enter here. Click the Add button to create the new user. Use the same commands that you saw in Listing 1 to see information about the new Fedora user, as shown in Listing 3. Listing 3 shows that a new group is created with name john and group ID 1001. When you add a new user, the primary group — and any other groups that you want the user to be a member of — must exist before you can create the user. So, if you want to add a user jane with group jane on the Fedora system, you must first create a group jane. You use the groupadd command to create the group. Listing 4 shows how to create both the group and the user. As before, you need root authority to add users and groups and to set passwords for other users. Changing password for user jane. The requirement to have a group defined before the new user is created has one exception. 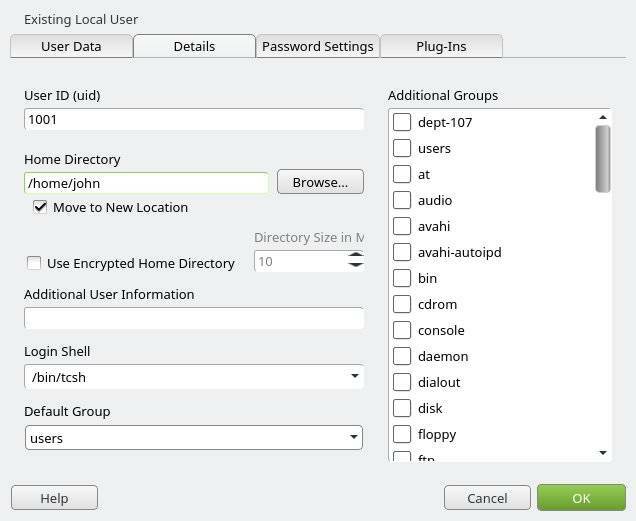 As in the openSUSE example (Listing 2), you can create a Fedora user without specifying the -g option with a group name. When you do, useradd creates a new group with the same name as the username. I explain this behavior in the “” section. In Listing 4, I use the -g option to specify the primary group for user jane and the -G option to specify an additional group, users. You see that group jane is created with group ID 1002. Linux has no command that’s analogous to the id command to display information about the group ID associated with a group name. In the “” and “” sections, I show you how to find out information about a group. I also omit the -m option, yet a home directory is created. Again, see “” for an explanation. When you create a new user and a new home directory is created, the directory is populated with several files and subdirectories that, by default, are copied from /etc/skel. Some subdirectories might be created in /etc/skel when a package is installed, or the subdirectory might be created in the user’s home directory when the package is first used. So, you will see many differences in skeleton directories according to which packages are installed and whether they add files or directories to /etc/skel, or whether they wait for a user to use the package. Listing 5 shows the contents of the home directory for user jane on the openSUSE system and then on the Fedora system. In each case, the diff command verifies that the home directory contents match /etc/skel. drwxr‑xr‑x 7 jane users  4096 Feb 15 12:55 .
drwxr‑xr‑x 6 root root   4096 Feb 15 12:55 ..
drwx‑‑‑‑‑‑. 3 jane jane 4096 Feb 15 21:33 .
drwxr‑xr‑x. 5 root root 4096 Feb 15 21:33 .. In Listing 5, notice the different profile files that are created. Refer to “Learn Linux, 101: Customize and use the shell environment” if you need more information about the various profile files that the bash shell uses. You might be wondering why user and group ID numbering starts at 1000, or why the openSUSE system puts all users in the users group, whereas the Fedora system creates a new group for each user — or why I did not need the -m option to create a home directory on Fedora. The /etc/login.defs file is a text file that contains several definitions related to system login. Some of the values in this file control user and group creation, and others control system behavior at login time. Listing 6 shows a few lines extracted from the login.defs file on openSUSE. #UIDs for dynamically allocated administrative and system accounts. #GIDs for dynamically allocated administrative and system groups. #the same as gid, and username is the same as the primary group name. #This also enables userdel to remove user groups if no members exist. Listing 7 shows the same values from my Fedora system. The different values for CREATE_HOME explain why I need the -m option on openSUSE but can omit it on Fedora. Similarly, the different values for USERGROUPS_ENAB control whether a new user has a dedicated group or becomes a member of the users group. #This enables userdel to remove user groups if no members exist. The UID_MIN and GID_MIN specify the starting values for ordinary users. Values in the range SYS_UID_MIN to SYS_UID_MAX and the corresponding group limit values are reserved for system users. See the “” section for more information on system users. Note: Historically, ordinary-user numbers started at 500, and you might still find systems with this lower limit. Both the useradd and groupadd commands have more options than I have used in the examples so far. Table 1 shows the common options for the useradd command. – -base-dir The default base directory in which user home directories are created. This is usually /home, and the user’s home directory is /home/$USER. – -comment A text string, such as the user’s full name, that describes the ID. --home A specific directory name for the home directory. – -expiredate The date on which the account will expire or be disabled, in the form YYYY-MM_DD. 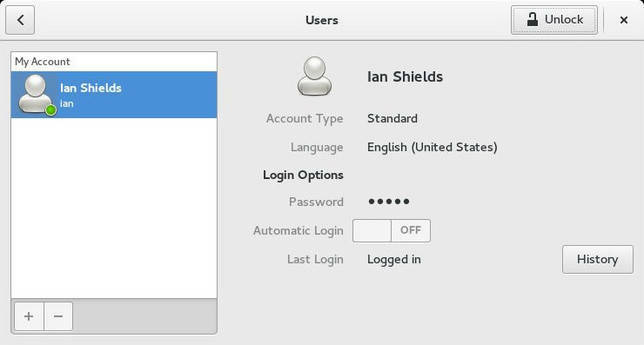 – -gid The name or number of the initial login group for the user. The group must exist. --groups A comma-separated list of additional groups to which the user belongs. -K Can be used to override defaults from /etc/login.defs. --create-home Create the user’s home directory if it does not exist. Copy the skeleton files and any directories from /etc/skel to the home directory. --non-unique Permit a user to have a nonunique ID. – -password The encrypted password. If a password is not specified, the default is to disable the account. You will usually use the passwd command in a subsequent step rather than generating an encrypted password and specifying it on the useradd command. – -shell The name of the user’s login shell if it is different from the default login shell. – -uid The nonnegative numerical user ID, which must be unique if -o is not specified. The default is to use the smallest value that is at least UID_MIN and also greater than the ID of any existing user. Some systems, including Fedora and Red Hat distributions, have extensions to the user-creation commands. For example, Fedora and Red Hat systems have a -n option to prevent useradd from creating a home directory. Be aware of such possible system differences and refer to your system’s man pages if in doubt. Graphical interfaces, and also the useradd command, might perform additional tasks, such as creating the user’s mail file in /var/spool/mail. Group names must begin with a lowercase letter or an underscore, and usually contain only those characters along with hyphens or digits. Table 2 shows common options for groupadd. -f Exit with success status if the group already exists. This option is handy for scripting when you do not need to check whether a group exists before trying to create it. -g Specifies the group ID manually. The default is to use the smallest value that is at least GID_MIN and also greater than the ID of any existing group. Group IDs are normally unique and must be nonnegative. -o Permit a group to have a nonunique ID. Deleting a user or group is much simpler than adding one, because the relevant commands have fewer options. In fact, the groupdel command to delete a group requires only the group name; it has no options. You cannot delete any group that is the primary group of a user. If you use a graphical interface for deleting users and groups, the functions are similar to the commands that I show. You delete a user by using the userdel command. Add the -r or --remove option to remove the user’s home directory and its contents, along with the user’s mail spool. Listing 8 shows how to add a group jane2 to the openSUSE system and then add two more users who make use of the group. User jane2 has primary group jane2, and user jane3 has jane2 as a secondary group. After user jane2 is deleted with the userdel command, the id command shows that the group jane2 is still a secondary group for user jane3. The second attempt to use groupdel to remove the group jane2 is successful because user jane3 has jane2 only as a secondary group. If USERGROUPS_ENAB is set to yes in /etc/login.defs, as it is in my Fedora system, a group with the same name as the user is also deleted, provided that group is not the primary group of another user. Listing 9 shows how the different /etc/login.defs file on Fedora influences user and group deletion. In this example, users jane2 and jane3 share a primary group, jane2. userdel: group jane2 is the primary group of another user and is not removed. You can use a -f or --force option for userdel to delete a user and the same-named group. This option is dangerous, so use it only as a last resort. Read the man page carefully before you do. If you delete a user or group, and files that belong to that user or group are on your filesystem, the files are not automatically deleted or assigned to another user or group. Output from the ls command shows the numeric value of the user or group if the user or group does not exist, as Listing 10 from my openSUSE system shows. Now that you can create or delete a user ID or a group, you might also need to modify one. Or you might need to suspend a user’s privileges on your system without deleting the user. Suppose that user john wants to have the tcsh shell as his default. From a graphical interface, you can often find a way either to edit a user (or group), or to examine the properties of the object. Figure 5 shows the Details dialog box for the user john on the openSUSE system. In Figure 5, I enter /bin/tcsh in the Login Shell field to change the shell to tcsh. From the command line, you can use the usermod command to modify a user account. You can use most of the options that you use with useradd, except that you cannot create or populate a new home directory for the user. If you need to change the name of the user, specify the -l or --login option with the new name. You probably want to rename the home directory to match the user ID. You might also need to rename other items such as mail spool files. Finally, if the login shell is changed, some of the associated profile files might need to be altered. Listing 11 shows an example of the things you might need to do to change user john to john2 with /bin/tcsh as the default shell and renamed home directory /home/john2. If you need to modify a user’s additional groups, you must specify the complete list of additional groups. Linux has no command to add or delete a single group for a user. Linux imposes restrictions on changing the name or ID of a user who is logged in or who has running processes. Check the man pages for details. If you change a user ID number, you probably want to change files and directories owned by that user to match the new number. When you need to modify group information, use the groupmod command. Use the -n option to change the group name, and the -g option to change the group number. In Listing 12, I change the group john to john2 on my Fedora system. Notice in Listing 12 that the group name for the home directory of user john also changed when I changed the group name — not surprisingly, because groups are represented in the filesystem inodes by their numbers rather than by their names. If you change a group’s number, you need to update any users for which that group is the primary group or a secondary group. Modern versions of groupmod do this updating for you, but older versions might update only primary groups, or make no updates. Listing 13 shows how to change the group number for john2 to 1020 on my Fedora system. Here, groupmod updates the primary group for user john and both primary and secondary groups for user john3, who has group john2 as a secondary group. Usually, you want to update the files and directories that belong to a group to match the new group number, because groupmod does not do this for you. The same process applies to changing both user and group numbers. Listing 14 shows how to change the group of all the affected files in the /home filesystem. Your system might have other files that are affected, so avoid renumbering users and groups if at all possible. You have already seen the passwd command, which is used for changing a user password. The password is (or should be) unique to the user and can be changed by the user. The root user can change any user’s password, as I did when setting up new users. Groups can also have passwords, which you set with the gpasswd command. Users who know the group password can join a group temporarily by using the newgrp command. You need to weigh the advantages of adding a user to a group with usermod against the security issue of having too many people that know the group password. If you need to prevent a user from logging in, you can suspend or lock the account by using the -L option of the usermod command. Use the -U option to unlock the account. Listing 15 shows how to lock user john3 and what happens if john3 tries to log in to the system. Note that when the john3 account is unlocked, the existing password is restored. You might have noticed back in Figure 1 that the dialog box has several tabs with additional user properties. In Figure 5, I use the Details page to change a user’s login shell. You are familiar now with using the passwd command to set user passwords. In addition, the passwd command — and the usermod command and another command, the chage command — can perform many tasks related to user accounts. Table 3 shows some of these options. -L -l N/A Lock or suspend the account. -U -u N/A Unlock the account. N/A -d N/A Disable the account by setting it passwordless. -e -f -E Set the expiration date for an account. N/A -n -m The minimum password lifetime in days. N/A -x -M The maximum password lifetime in days. N/A -w -W The number of days of warning before a password must be changed. -f -i -I The number of days after a password expires until the account is disabled. N/A -S -l Output a short message about the current account status. Refer to the appropriate man pages on your system for more details on these and other options. /etc/passwd is the password file containing basic information about users. /etc/shadow is the shadow password file containing encrypted passwords. /etc/group is the group file containing basic information about groups and which users belong to them. /etc/gshadow is the shadow group file containing encrypted group passwords. These files are updated by the commands that you have already seen in this tutorial, and you will meet more commands for working with them after I discuss the files. All of these files are plain text files. In general, do not edit them directly. Use the tools provided for updating them so that they are correctly locked and kept synchronized. The password (/etc/passwd) and group (/etc/group) files are both shadowed for security reasons. The passwd and group files themselves must be world readable, but the encrypted passwords should not be world readable. Therefore, the shadow files contain the encrypted passwords, and these files are readable only by root. The necessary authentication access is provided by an suid program that has root authority but can be run by anyone. Make sure that your system has the permissions set appropriately. Listing 16 shows the permissions on my Fedora system. Although it is technically possible to run without shadowed password and group files, this is almost never done and is not recommended. The /etc/passwd file contains one line for each user in the system. shows example lines. Each line contains seven fields separated by colons (:), as shown in Table 4. Username The name used to log in to the system. For example, jane. Password The encrypted password. When using shadow passwords, it contains a single x character. (UID) The number used to represent this username in the system. For example, 1002 for user jane. (GID) The number used to represent this user’s primary group in the system. For example, 1002 for user jane. (GECOS) An optional field used to describe the user. For example, Jane Doe. The field can contain multiple comma-separated entries. It is also used by programs such as finger. The GECOS name is historical. See details in man 5 passwd. Home The absolute path of the user’s home directory. For example, /home/jane. Shell The program that is automatically launched when a user logs in to the system. This is usually an interactive shell such as /bin/bash or /bin/tcsh, but it can be any program, not necessarily an interactive shell. For the mail user in Listing 17, it is /sbin/nologin, which indicates that the system mail user cannot log in. The /etc/group file contains one line for each group in the system. Listing 18 shows example lines. Each line contains four fields separated by colons (:), as shown in Table 5. Group name The name of this group. For example, john2. Password The encrypted password. When using shadow group passwords, it contains a single x character. (GID) The number used to represent this group in the system. For example, 1002 for group jane. Members A comma-separated list of group members, excepting those members for whom this is the primary group. You can see from Listing 18 that user john3 is a member of group john2. The /etc/shadow file contains encrypted passwords, along with password- and account-expiration information. Secure this file to prevent general access. See the man page (man 5 shadowman5shadow) for information on the nine colon-separated fields. Passwords can be encrypted with one of several encryption algorithms. Older systems used DES or MD5, but modern systems typically use Blowfish, SHA-256, or SHA-512, or possibly MD5. Regardless of encryption algorithm, passwords are salted so that two otherwise identical passwords do not generate the same encrypted value. Listing 19 shows how to set identical passwords for users jane and john, and then shows the resulting encoded passwords in /etc/shadow. Note: I am breaking the long lines from /etc/shadow for publication. The leading $6$ in the password field indicates that my Fedora system uses SHA-512 for encryption. My openSUSE system also uses SHA-512. See the man page man 3 cryptman3crypt for other possible values. The salt is a variable-length field of up to eight characters, ending with the next $ sign. The encrypted password follows. Earlier in this tutorial, I said that Linux has no command for groups analogous to the id command for users. You saw some entries from /etc/group in Listing 18, so you can easily construct a grep command to extract an individual line. Listing 20 shows that you need to be careful to avoid finding more than one entry, or even entries for nonexistent groups such as john, which is part of two other valid group names. The getent command — part of the Name Service Switch facility — provides a generalized way to access the user and group databases, and other databases for hosts, networks, and services. The getent command requires the name of a database and a lookup key. If no key is provided, many of the databases support returning a full enumeration of their entries. You do not need to have root authority to use getent, although you do need to be able to read the database that you want to use, so I use user root in all my examples. Listing 21 shows basic examples of getent use. Use the text-filtering tools you learned about in “Learn Linux, 101: Text streams and filters” to extract particular fields or construct more-complex queries. Listing 22 shows some possible uses. Now that you know about getent, you can use it to extract and process your user and group information. Listing 23 shows a simple script to extract group information that is somewhat analogous to the information returned by the id command for users. do slist="$slist $(id ‑u $u)($u)"
test "$priu" ‑a "$secu" && allu="$priu,$secu" || allu="$priu$secu"
echo "group: $getgroup: no such group"
I saved the script in Listing 23 as groupid.sh on my system. I also added a group dept-107 that has no users to show you how the script works in such a case. Listing 23 shows some usage examples. For this illustration, I use my ordinary user login rather than root. By convention, system users usually have an ID that is lower than 100, with root having ID 0. Normal users start automatic numbering from the UID_MIN value set in /etc/login.defs, with this value commonly being set at 500 or 1000. Besides regular user accounts and the root account on your system, you will usually have several special-purpose accounts, for daemons such as FTP, SSH, mail, news, and so on. Listing 25 shows entries from /etc/passwd for some of these accounts. Such accounts frequently control files but should not be accessed by normal login. Therefore, they usually have a login shell specified as /sbin/nologin or /bin/false, so that login attempts will fail. In this tutorial, you have seen several commands that manipulate the account and group files and their shadows. In this final section, I introduce you to a few remaining commands that are related to user and group administration but are not in the LPI objectives. Use the man pages or search the Internet for more information. This command makes user jane an administrator of the group john2. User jane can now use the -a option of groupadd to add members to the group john2. Similarly, an administrator can delete members of a group. Note: Adding a group administrator does not make the administrator a member of the group if he or she is not already a member. Note: The openSUSE Leap 42 system does not use /etc/gshadow and does not support group administration through the -A option of gpasswd. If you create a group password, the encrypted form is stored in /etc/group, which is world readable. You can use the vipw command to edit /etc/passwd safely and the similar vigr command to edit /etc/group safely. These two commands lock the necessary files while you make changes in the vi editor. If you make changes to /etc/passwd, vipw prompts you to see if you also need to update /etc/shadow. Similarly, if you update /etc/group by using vigr, you are prompted to update /etc/gshadow. If you need to remove group administrators, you might need to use vigr, because gpasswd only allows addition of administrators. Four other related commands are also not listed in the LPI objectives: pwconv, pwunconv, grpconv, and grpunconv. These commands are used for converting between shadowed and nonshadowed password and group files. You might never need these commands, but be aware of their existence. See the man pages for details. This concludes your introduction to user and group account management. Roadmap for LPIC-1 Use the roadmap for LPIC-1 to find the tutorials to help you study for LPIC-1 certification based on the LPI Version 4.0 April 2015 objectives. System Databases and Name Service Switch Learn more about the databases that you can use with getent at System Databases and Name Service Switch.